Hello .... I'm wading through the mass of unused craft stash as I decide what to keep.. 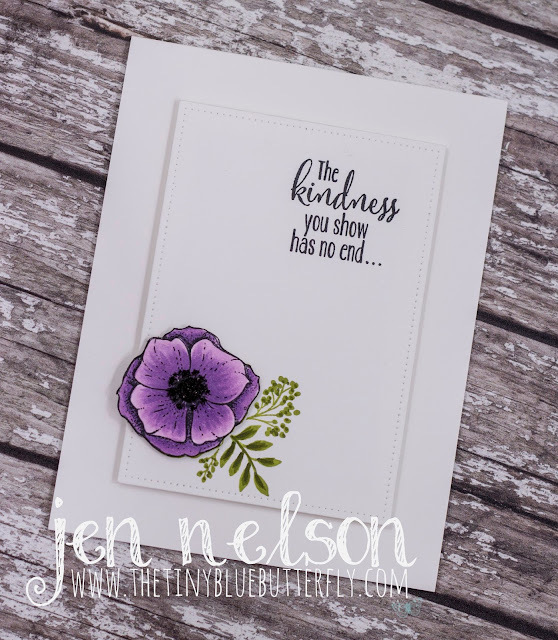 I was unsure of this set from this years Sale-A-Bration from Stampin Up but decided to use the flower for this card and add some bright purple from the Amazing You set. I stamped the image twice and the leaves onto the back panel I die cut using the pierced rectangles from Avery Elle. I then coloured in and fussy cut out the image to add some dimension. The centre is then filled with black glass glitter. I added a sentiment from another Stampin Up sentiment and then mounted the panel onto a white card blank. beautiful design, love the single flower with the sentiment. I too and trying to decide what to do with my many many stamps and dies.